Two great machines in one. Ideal for people who are sitting a good portion of the day. Sitting for long periods of time is not the problem, it's being stationary while standing or sitting that creates problems. 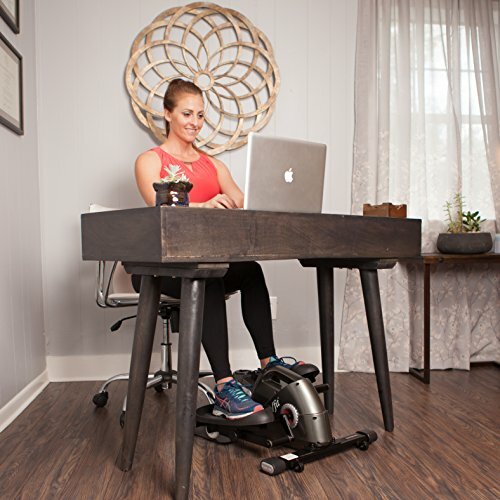 The mini elliptical will fit comfortably under a desk and you can get your legs moving while typing, talking on the phone, or reading. Want to turn up the workout while on break, switch into stand up mode, add some arm weights and burn even more calories. Burns up to 300 calories while sitting and even more while standing. Converts easily from stand up to sit down mode. Easy to move with a top handle, a front handle and rear wheels. 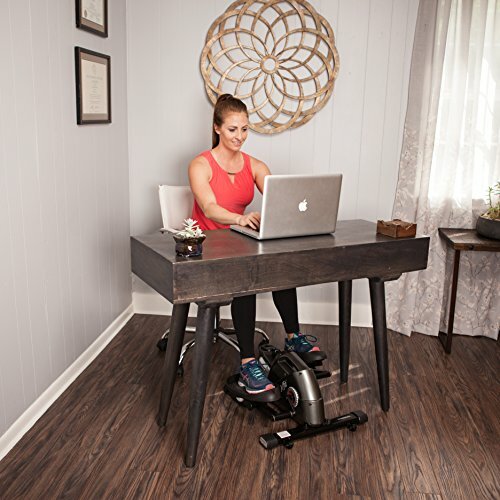 THE ONLY UNDER DESK & STAND UP ELLIPTICAL: Features a unique, smart design with adjustable angle pedals that you won't find anywhere else! This advanced feature allows for BOTH under desk AND standing up exercising as it also provides you with the perfect fit! HIGHLY VERSATILE & COMPACT DESIGN: This little genius fitness elliptical trainer sports a compact design that will allow you to fit it under any desk with ease and also features, unlike other competitive alternatives, a very practical top handle to allow you to move it anywhere easily AND a front handle for additional support and the capability to hold a chair with wheels. 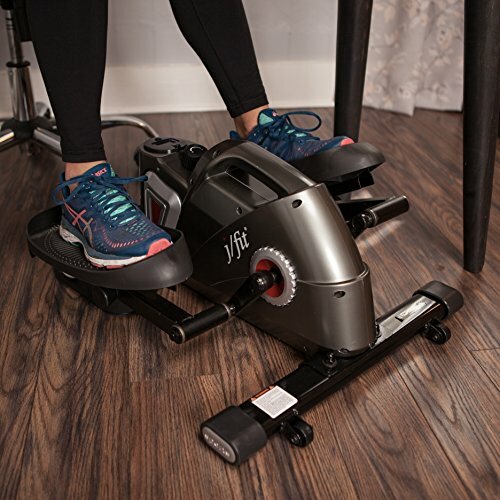 SUPER-QUIET: This is a perfect addition to any home gym or can be the perfect solution for you who need an efficient piece of fitness equipment to stay fit as you work on your desk without disturbing anyone in the house. The large rollerblade wheels provide you with a smoother, quieter ride while this design also makes for less wear and tear and improved durability. If you experience squeaks from your wheels, any lubricant such as WD40 sprayed on the wheels will quickly eliminate the squeak. MEASURE YOUR PROGRESS: With every 2 in 1 elliptical trainer for home exercise you also get a Series 1050 Monitor that records your time, distance, speed and calories burnt! It features a very easy to use design with a turning dial for both standing and under desk exercising. ADJUSTABLE DIFFICULTY TO MATCH YOUR NEEDS: Whether you like going hard and really sweating it out or you like a casual work out over a longer period of time at your own comfort, we got you covered! This mini elliptical features a tension dial that can provide you with an adjustable resistance, according to what you feel like each day!